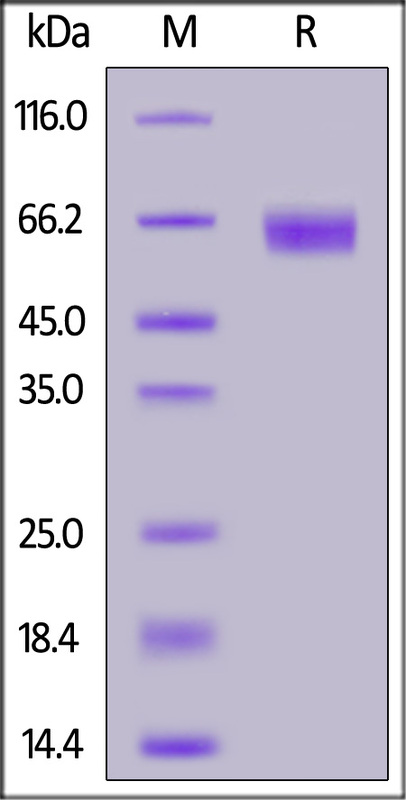 Human IL-4 R alpha, Fc Tag (ILR-H5253) is expressed from human 293 cells (HEK293). It contains AA Met 26 - His 232 (Accession # P24394-1). The protein has a calculated MW of 50.4 kDa. The protein migrates as 60-80 kDa under reducing (R) condition (SDS-PAGE) due to glycosylation. 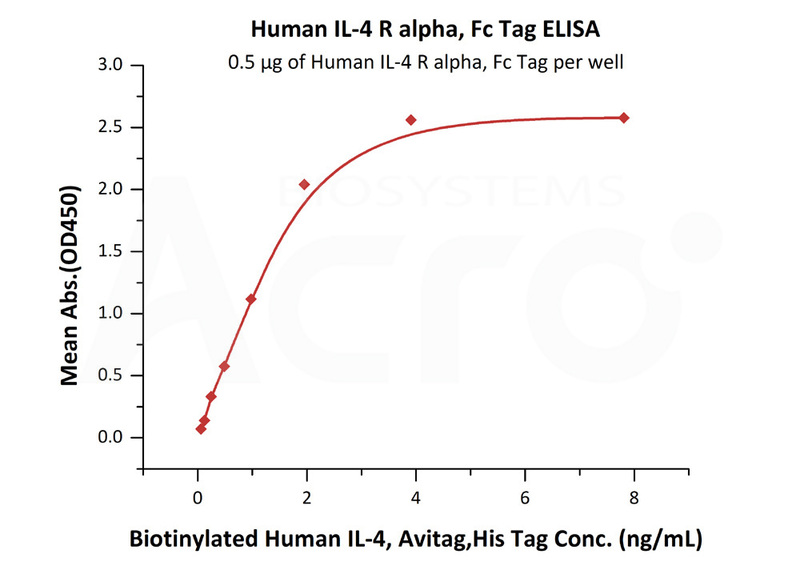 Human IL-4 R alpha, Fc Tag on SDS-PAGE under reducing (R) condition. The gel was stained overnight with Coomassie Blue. The purity of the protein is greater than 95%. Immobilized Human IL-4, Tag Free (Cat. No. 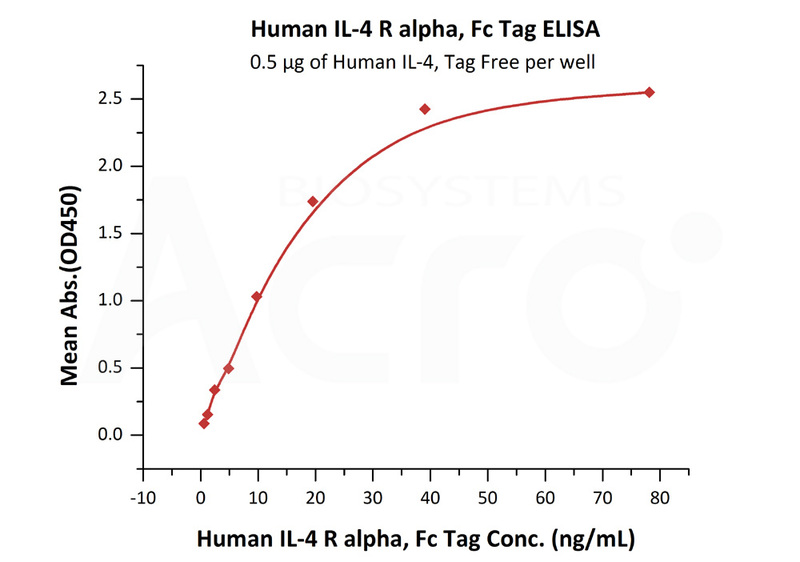 IL4-H4218) at 5 μg/mL (100 μL/well)can bind Human IL-4 R alpha, Fc Tag (Cat. No. ILR-H5253) with a linear range of 1-20 ng/mL (QC tested). IL-4 R alpha is also known as IL4R, CD124, IL-4RA.This gene encodes the alpha chain of the interleukin-4 receptor, a type I transmembrane protein that can bind interleukin 4 and interleukin 13 to regulate IgE antibody production in B cells. Allelic variations in this gene have been associated with atopy, a condition that can manifest itself as allergic rhinitis, sinusitis, asthma, or eczema. The binding of IL-4 or IL-13 to the IL-4 receptor on the surface of macrophages results in the alternative activation of those macrophages. Interleukin-4 receptor has been shown to interact with SHC1. (1) Tundup S., 2012, Ann. N. Y. Acad. Sci., 1253: E1–E13. (2) Ikizawa K, Yanagihara Y., 2000, Biochem. Biophys. Res. Commun., 268 (1): 54–9. (3) Kashiwada M., 2001, J. Immunol., 167 (11): 6382–7.